Edward Scissorhands. 20th Century Fox 1990. As I think about what to write about my preconceptions, I realize that I know a lot about this movie, more than I remember at first glance, but I still don’t reallyknow about it. It’s just a thing that’s been there, and at the same time it makes perfect sense and is completely alien. Johnny Depp’s character is a Frankenstein-type monster, I guess? That or an automaton. What’s important is that through a quirk of fate, he has vicious blades instead of hands, which is ironic because he’s actually very gentle. But somehow, that doesn’t seem powerful enough for such a popular movie. Peg, an Avon lady looking for a new sale discovers a young-looking man, Edward, living alone in a gothic house on a hill overlooking her neighborhood. 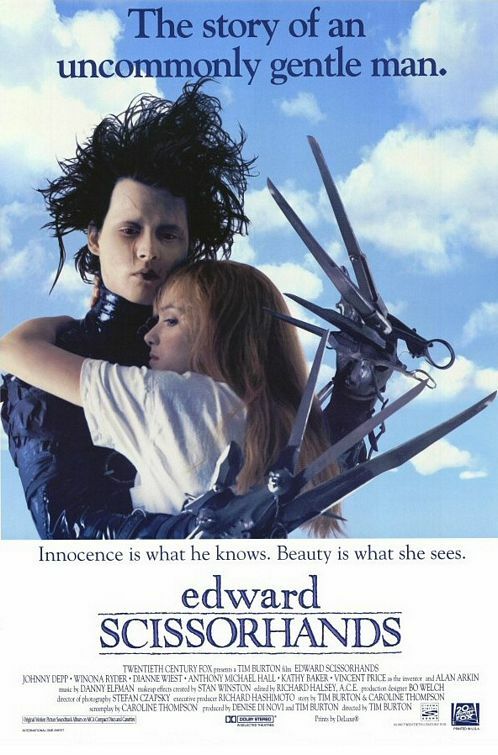 Edward has the most peculiar and audience-surprising feature of having a set of intimidating scissors where his hands should be. The creation of an Inventor with a collection of wonderful Burton-Gothic inventions who decided to give one of them a heart, Edward has lived alone since the Inventor died before giving him a set of normal hands. Peg takes Edward home to live with her, where he’s immensely popular with her neighbors as an oddity, topiarist, and hairstyler. Edward falls for Peg’s daughter Kim, but as Kim comes to accept him, her boyfriend Jim grows a burning resentment, and the moment something goes wrong, the entire town begins to fear Edward. I was surprised at how readily the neighborhood accepted Edward initially (only Peg and Kim were initially frightened by the Freddy Krueger specials), but then the whole plot is framed as a child’s bedtime story, so that and the pastel houses aren’t too extreme. I always felt a little awkward watching the neighborhood housewife pirhanas swarm around Edward, exploiting him. I kept waiting for the other shoe to drop. But then when it did it got downright frustrating, because it all happens because people don’t share what they know. If Kim really wanted to help Edward, she really had no reason not to tell someone what actually happened when he got in trouble. Jim can still instigate things because apparently restraining orders aren’t a thing that exist in this world. I always had the impression that Edward never spoke, but he does. Just not much. Johnny Depp delivers a shy, understated performance unlike anything I’ve seen him in, especially recently. I’m also impressed that Anthony Michael Hall could play a character that I could be completely disgusted by, since I mostly know him from his younger, insecure teen roles. This was a powerful story, but for all the reasons that make me reluctant to see it again. The visuals were interesting, but you can see those, and the actors, in any other Burton film. Watch this movie: for Tim Burton’s modern mashup of Frankenstein and Beauty and the Beast. Or maybe for Johnny Depp in leather. Don’t watch this movie: and get any ideas about your pruning shears and gardening gloves.